Lamb or ham? That is the question at our house for Easter dinner. I grew up eating lamb and ham for our Easter dinners until I was a teenager. The grown-ups always wanted the lamb but after a while my grandmother stopped making it because most of it would go to waste. I kind of missed it because I really enjoyed the flavor of lamb. I have been in a similar pattern with my own family. They ask for it and then they don't eat it. I would make both and watch as the lamb would go untouched but for a few slices on my plate. When asked the family always says lamb and ham. I think they said that because it rhymed and it has been our traditional dinner for years. This year we are more than likely going to stick with just ham--again. BUT--I love lamb and decided that I would make something for our dinner this past month that I liked and enjoyed. 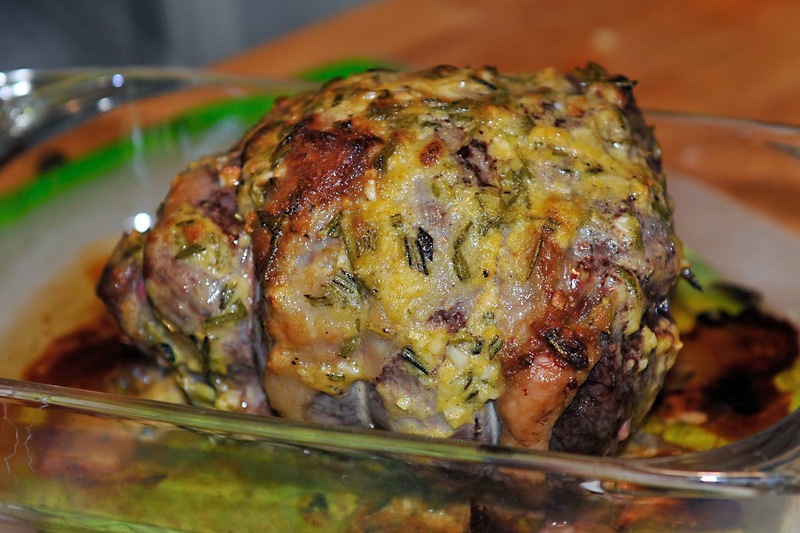 I bought a small boneless leg of lamb and watched as every slice disappeared from the table. Not on one occasion but two. WHAT JUST HAPPENED? That was strange. The kids loved it. That was the first time. The second time was last week while my sister was visiting. I was greeted with, "oh, I don't like lamb" right before dinner was to go into the oven. I proceeded to make the sauce to coat the lamb with and explained that I doubt she had ever tasted lamb like this. She was willing to give it another try and she was pleasantly surprised that the flavor of the lamb was mild and the coating of herbs and sauce tasted delicious. I served it with mint jelly and we had two slices left. I can't prove this but I have a feeling that the "leg" or the bone was throwing my family off. I wonder if having the bone in the lamb made the flavor profile too strong for their young palettes? I believe by removing the bone it helped with the look and possibly the flavor too. Let me know if you have any experience with this thought. I am pleasantly surprised that I have been able to add a new meat to our menu. I get kind of tired of beef and chicken to be honest. 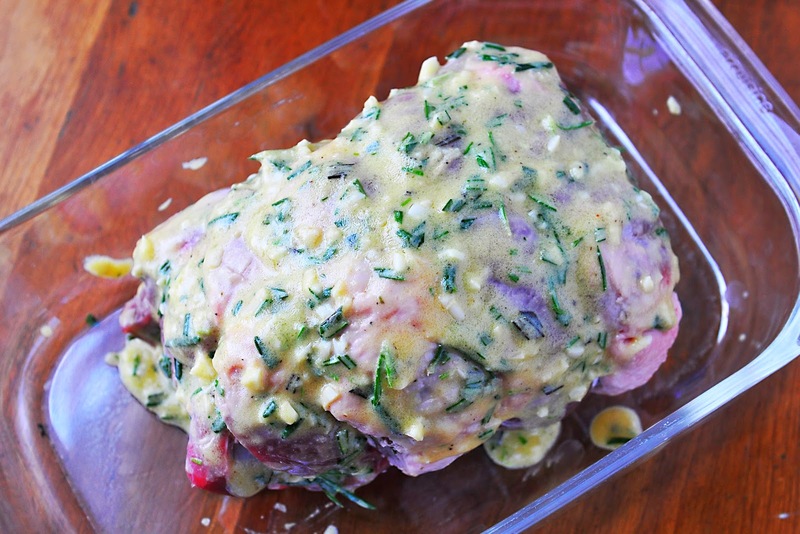 **extra oven twine to retie lamb if you wish to unroll meat and add sauce to the inside and reroll. 2. Prepare sauce by combining the first 7 ingredients in a bowl. 3. I chose to cut and untie my roast. I smeared the sauce all of the inside of the lamb and re-rolled the roast with new oven twine. Place the roast in a baking dish and add the remaining sauce to the outside. See picture above. 4. Roast in oven for 60-70 minutes. Use a meat thermometer. This will help you to get the exact doneness of your lamb. We like ours to be pink on the inside, 135 degrees is preferred for us. 5. Let roast rest for 15 minutes then slice the roast to 1/4 inch thickness and return to roasting pan. All of the juices and marinade will cook together. The two together make a wonderful sauce that the slices will be coated in when you return the slices to the roasting dish. 6. Serve with mint jelly. I'm a big lamb lover from way back. My problem is loving the flavor soooo much, that I never try sauces or rubs. I get excited when I hear the outside fat bubbling and turning brown.I know the fat isn't healthy, but I have to have a couple of bites, anyway. Your recipe sounds delicious and just made me open my eyes to a new dinner adventure. Thanks!